Often when road debris strikes a windshield it creates damage to the glass. Most small damage can be repaired without removing or replacing the windshield. However, if left unattended, the damage will continue to spread until the crack or break expands to cover a large area of the windshield. Stop the cracking process in its tracks and call Murphy's Auto Glass & Tire Express today! Feel free to stop by our shop located in Orangeburg, SC or call us at 803-536-5500 or 866-687-7495 to schedule an appointment with one of our mobile service technicians. We have a team of auto glass specialists who are willing to come to your location anywhere in our service area in South Carolina and repair your windshield. Repairing your windshield is safe and convenient. Typically, rock chips are considered repairable if they are about the size of a quarter. Cracks that extend six inches in length or less and are not directly in the driver's line of sight are also repairable. The auto glass repair experts at Murphy's Auto Glass use the highest quality resins and latest technological advances to make sure the structural integrity of your windshield is restored in less than 20 minutes. So put your mind at ease by allowing Murphy's Auto Glass and Tire Express to repair your damaged windshield today. Rock chips left unattended can quickly spread into cracks and lead to costly windshield replacements. Windshield repair is the eco-friendly option. Windshields are not recyclable and add to our nation's landfills. 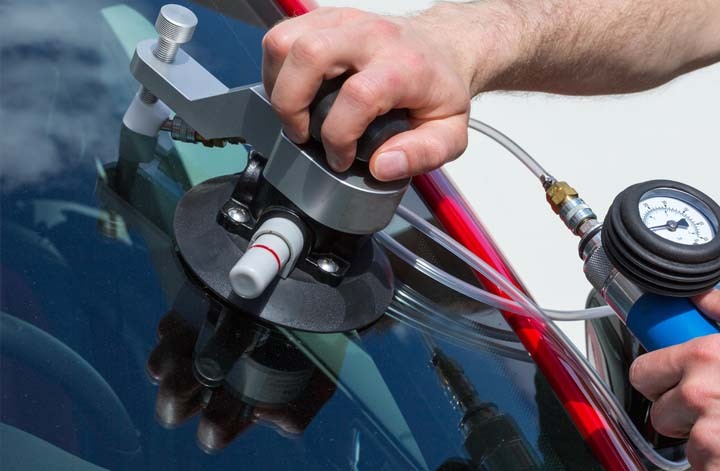 Windshield repair is the best method to avoid breaking the factory seal around your windshield. By not removing the windshield, potential water and air leaks can be avoided. Most insurance companies allow policyholders to make a no-fault claim for a windshield repair. Murphy's Auto Glass is recognized by insurance companies as an authorized shop for windshield repair. We will handle all the insurance paperwork for you, making your insurance claim a breeze. Typically, insurance companies will even waive the deductible amount for a windshield repair. A windshield repair is a much cheaper alternative to a complete windshield replacement. Windshield repair (rock chip repair) is safe, smart, and affordable. The friendly staff at Murphy's will be glad to walk you through the windshield repair process and answer all your questions.